9:21 a.m. — Police performed a welfare check in the 200 block of North Market Street. They were unable to contact the person they were looking for. 9:58 a.m. — Police were called to McDonald’s on Portland Way North after two drivers backed into one another and their attempt to exchange information got pretty heated. No one was injured in the accident. 11:32 a.m. — A man was picked up on a domestic violence charge out of Crestline. 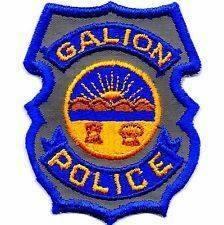 He was arrested in the 300 block of East Parsons St.
5:00 p.m. — Police responded to a report of a sexual assault at Galion Hospital. 5:42 p.m. — A man called police because he wanted officers to talk to a neighbor who reportedly “flipped off” his son. The incident was in the 1200 block of East Walnut. 8:04 p.m. — A resident in the 300 block of South Union Street reported a teen boy, with white shorts and possibly a grey checked shirt stole a plant from his porch and ran off. He told police two plants had been taken. 8:50 p.m. — Police responded to the 300 block of West Church Street where a caller reported a dog had been barking for three or four hours. 9:36 p.m. — A resident in the 100 block of Smith Street reported a relative had just punched his truck and he wanted a report filed. 10:03 p.m. — A caller in the 1,400 block of Baehr Street reported a wallet had been storing on July 4. 10:22 p.m. — Police received a report of four kids on bikes making a lot of nice and acting suspiciously in the 100 block of Switzer Drive. 11:52 p.m. — A resident in the 1400 block of Baehr Street reported that someone keeps driving by the residence and yelling. He requested some extra patrols in the area. 12:48 a.m. — Police received a call about two young girls in the area of Heritage Baptist Church on Ohio 61. The caller said the girls were on mountain bikes and there were no lights on the bikes. 2:43 a.m. — Officers took information for a report from a resident in the 400 block of Libby Lane who reported receiving threatening texts. 10:09 a.m. — A resident in the 300 block of Kroft Street reported a license plate had been stolen. He wasn’t sure when, but reported receiving a ticket from Washington, D.C.
11:31 a.m — Police received a report of three women in a blue or black car in the 100 block of Finley Drive who were acting suspiciously and had knocked on her door. She did not now who they were, just that it seemed odd. 12:52 p.m. — Police responded to Dollar General on Harding Way East about a woman who was stuffing clothes into her purse. A summons was issued to the woman. 1:42 p.m. — After a caller complained, officers warned kids that they were not allowed to be riding bikes in the skate park a East Park. 8:18 p.m. — Police received a call from a worker at Ralphies who reported that someone had dropped a clip with bullets in it. 9:35 p.m. — A young girl was transported to the hospital after she reported cut her head while running into a pole. 5:10 a.m. — Officers investigated a report of a guy going through another person’s vehicle in the 300 block of South Market Street. 11:52 a.m. — A woman stopped a patrol car in the 300 block of Harding Way East to file a report about someone she had an issue with in Bucyrus and who had followed her to Galion. 3:49 p.m. — One “kid” was released to his mother after taking another person’s key chain in the 300 block of Harding Way East. 11:39 p.m. — Someone called police to report a “bunch of geese” in the road near West Atwood and Union Street. 11:35 a.m. — Officers investigated a disturbance in the 500 block of S. Sandusky Ave. and it was a domestic issue. 11:53 a.m. — Officers picked up a knife laying in the 200 block of Woodlawn Ave. and destroyed it. 11:58 a.m. — A report of a domestic dispute in the 300 block of Lawn Ave. was investigated. 12:49 p.m. — Officers checked the welfare of a man in the 800 block of S. Walnut. He was napping while on his lunch break. 3:44 p.m. — A Michigan Dr. resident reported receiving harassing phone calls. 3:49 p.m. — A bicycle abandoned in the 500 block of S. Spring St. was brought to the Police Department. 3:52 p.m. — A report of a theft in the 600 block of E. Warren St. was investigated. 4:00 p.m. — A report of juveniles trespassing in the area of Charles and Wiley St. was reported. 4:07 p.m. — A report of a breaking and entering was reported at the Police Department. 5:27 p.m. — A resident in the 700 block of W. Perry Street reported someone trespassing on their property. 6:47 p.m. — A disturbance in the 600 block of E. Mary Street was investigated. 8:38 p.m. — Eight people were warned for trespassing after being caught swimming at the retention pond at Crossroads Industrial Complex. 1:51 a.m. — A disturbance in the area of Mansfield and Lane Street was investigated. 10:06 a.m. — Officers assisted Life Support team in the 300 block of E. Oakwood Ave.
11:13 a.m. — Officers investigated a domestic dispute in the 1000 block of E. Mansfield St.
12:44 p.m. — A theft report was made in the 300 block of W. Mansfield St.
1:40 p.m. — A syringe found in the area of Sandusky and Beal Av. was picked up and disposed of. 2:13 p.m. — A report of a dog in a hot vehicle was reported in the 100 block of Stetzer Rd. 3:13 p.m. — A disturbance in the 1000 block of S. East St. was investigated. 5:43 p.m. — A two vehicle accident was investigated at Rensselaer and Poplar St.
6:31 p.m. — A report of loud music was investigated in the 900 block of W. Perry St.
6:32 p.m. — A report of a disturbance was made in the area of Plymouth and Wingert St.
7:21 p.m. — A domestic dispute was investigated in the 1200 block of High St.
7:32 p.m. — A juvenile complaint was investigated in the 600 block of E. Charles St.
8:07 p.m. — A report of possible drug use was reported in the area of Harmon Park. 8:23 p.m. — A 31-year-old man, was arrested in the 100 block of W. Mansfield St. on charges of physical control. He was issued a date to appear in court and released to a sober party. 8:37 p.m. — A Next bicycle was reported stolen from the 1200 block of John St. overnight. 8:39 p.m. — A domestic dispute was investigated in the 1300 block of High St.
9:55 p.m. — Officers conducted a welfare check in the parking lot of Walmart. 10:00 p.m. — A dispute between neighbors in the 500 block of Failor St. was investigated. 12:31 a.m. — A resident in the 600 block of E. Warren St. reported being harassed. 4:51 a.m. — Officers investigated an open line 911 call from Eagle Crusher. 8:25 a.m. — A theft report was taken in the 400 block of S. Highland Av. 10:18 a.m. — Officers investigated a domestic dispute in the 1600 block of S. Sandusky Av. 11:55 a.m. — Two abandoned bicycles were picked up in the 200 block of S. Sandusky Av. and brought to the Police Department. 12:03 p.m. — A report of a possible identity theft was made at the Police Department. 12:04 p.m. — An abandoned bicycle was picked up in the 600 block of E. Oakwood and brought to the Police Department. 1:56 p.m. — A trespass complaint was investigated in the 300 block of W. Mansfield St..
4:06 p.m. — A theft report was made in the 300 block of Hopley Av. 5:43 p.m. — Property found in the 1200 block of E. Mansfield St. was brought to the Police Department. 5:45 p.m. — Two bicycles were reported stolen in the 300 block of E. Renssealer St. overnight. .
6:51 p.m. — An assault report was taken in the area of Sandusky and Mary St.
7:19 p.m. — A report of animal abuse was made in the 1000 block of W. Mansfield St.
7:44 p.m. — A theft report was taken at the Police Department. 8:04 p.m. — A report of juveniles smoking in the area of Lions Park was investigated. 8:18 p.m. — A 37-year-old man was arrested for possession of heroin. He was taken to the Crawford County Justice Center to be held for a court appearance. 12:19 a.m. — Officers assisted Crawford County Deputy on a traffic stop in the area of E. Charles St. and Wiley St.
1:27 a.m. — A 31-year-old man was arrested for domestic violence. He was taken to the Crawford County Justice Center to await a court appearance. 10:51 a.m. — A resident in the 400 block of McKinley Ave. reported his house broken into. 11:30 a.m. — Officers mediated a report of a domestic dispute in the 1300 block of Woodlawn Ave.
12:38 p.m. — Officers responded to a fight in the Kroger parking lot. Subjects were gone upon officers arrival. 12:49 p.m. — A report of a breaking and entering in the 1700 block of Marion Rd was unfounded. 1:10 p.m. — Officers investigated a two car, non-injury crash in the 100 block of Washington Square. 3:38 p.m. — A domestic disturbance in the 600 block of E. Rensselaer Street was mediated. 4:10 p.m. — A hit-skip crash of a parked vehicles driver side mirror was reported from the 200 block of N. Walnut Street. 4:43 p.m. — A report of kids throwing rocks and trespassing on property in the area of River and Sandusky Avenue was investigated. The juveniles were located and there was no damage and they were warned against trespassing. 5:46 p.m. — A report of a dog, a small white Scottie, running loose in the 100 block of Iron Street was investigated. 7:16 p.m. — An abandoned bicycle, a red and black mongoose, found in the 500 block of Hopley Avenue was brought to the Police Department for safe keeping. 8:40 p.m. — A report of a fight in the 500 block of Failor Street was investigated. 9:05 p.m. — A resident in the 200 block of Dudley Street reported a riding lawn mower stolen from the residence. 12:21 a.m. — A female reported a window of her vehicle broken out by a rock in the 100 block of W. Mary St.